Share & learn with us. Everyone welcome! Let’s get together for fun and learning – Again! Our annual holiday party will be held on December 12th. 7:00 PM at tRG studio. As always, we will be having a print show – please bring a print to hang and be prepared to talk briefly to everyone about your print. We will be awarding the prizes for the competition winners and we will have a few other fun surprises You are welcome to bring a guest and please bring an appetizer, entree, dessert, or drinks to share. We have tableware, cups, ice, and decorations covered already. You may use the following form to let everyone know what you are bringing. This list can be looked at first so that you can see what others have already signed up to bring and avoid duplicates. Just want to make anyone who plans on watching the live broadcast of the meeting tonight aware that the broadcast will start at approximately 7:30 PM tonight instead of 7:00 due to a presentation we are doing at the start of the meeting that cannot be broadcast over the air for copyright reasons. Nobody needs to bring ice, plates, cups, utensils, or soft drinks. The club is providing these items. You can see what is being brought here and you can add your items to the list here. There is a stove and microwave available at the location. Bring a print to hang! No firearms are allowed on the premises. 2012 competition awards will be presented at the party. This list will be posted soon on the competition info page with additional details and explanations but for now here is the basic information so that you can get started. For our next competition meeting in January assigned images will be photographed using any single light source other than sunlight. To be clear, this excludes multiple lights and/or sunlight. This is an opportunity for you to experiment with controlling the variables of light: intensity, duration, quality, direction, and color. Beginning in January we will be implementing our new policy of requiring AA ranked members to act as the third judge during competitions. We feel this is an educational experience for those who judge and will provide a fresh perspective each month. Don’t be shy and don’t hesitate to contradict Robert or Jim – we want to hear your thoughts! We will work our way down the AA rankings each month to pick the 3rd judge. If it’s someone’s turn and they are absent we will move down the list and the absent party will take their turn the following month if present. Final rankings for 2012 will be posted after the awards are presented at the holiday party this week. Our annual holiday meeting will be held this year on Thursday evening, December 13th at The American Legion “U.S.S. Tampa” Post 5, 3810 W. Kennedy Blvd. Tampa, FL 33609. We will start at 7:00 PM. Once again we will have print hanging exposition so please bring an unframed print to hang and tell us about. Food is pot luck, you can see what is being brought here and you can add your items to the list here. Please note – due to unforeseen personal obligations Doris Bowling may be unable to maintain the competition records at meetings for a while. If anyone is able to assist with this very important function please let us know, your help will be greatly appreciated. Robert has secured permission to use the room next door to our usual meeting location at his studio for our meetings. We should be able to start meeting in this roomier environment in the new year. Our first live broadcast of a meeting is now available below for re-playing. There was a technical glitch at some point during the print competition. The studio’s internet router shut down without anyone noticing. The router was reset during our intermission and the digital competition was broadcast as part 2. FYI during the beginning of the meeting when private club business was being discussed the audio was muted. Don’t be concerned if you hear no sound for several minutes during part 1. The videos have now been edited to remove “dead air” and audio anomalies. The competition scores have been recorded and up-to-date results are available now. Elections: Election of officers for a new 2-year term will take place in October. Now is the time to consider if you want to run or nominate someone for a position. Holiday Party: We will continue with our tradition of a pot-luck style holiday party this year, however we have outgrown the space available at tRG studio. If anyone has any suggestions for a larger space that we can make use of we would like to hear your suggestions. Beginning with this Friday’s meeting (08/17) our meetings will be broadcast live right here on our website. This will be an option for members who can’t attend but are able to watch from home. If you can’t watch live you can play it back later at your convenience. Once the meeting begins an embedded video feed will appear right here on the home page. The video will also be recorded and will be re-playable at any time. Please wait until 7:00 pm to access the homepage because the video won’t appear if you log on early and wait for it. If you have already accessed the homepage prior to 7:00 pm then make sure to close your web browser and then re-open it at 7:00 pm. Depending on your web browser’s settings it’s still possible that you might not see the video when you access the homepage after 7:00 pm. If it is past 7:00 pm and you do not see a video feed on the homepage then your browser may be set to load a stale or cached version of the page. In that case use your browsers refresh option. (Usually the F5 key or the circular arrows icon). If the refresh option doesn’t work you may also need to clear your browser’s cache and then re-access the homepage. Refer to your browser’s help file or Google how to the clear the cache in your browser. Robert and I have already made a couple of test broadcasts to work out the technical aspects and everything is set to go. The test broadcasts have been deleted and can’t be viewed but the broadcasts of the meetings will remain online for later viewing. In other news, the July competition scores have been posted and are available for viewing. This Friday’s competition subject is photojournalism – using a photograph to tell a story. 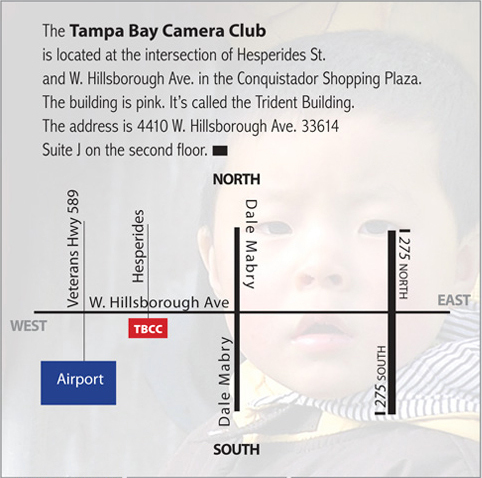 For our meeting this Friday we will go on a downtown Tampa photowalk. We will gather in Curtis Hixon Park and then I will lead a sunset/twilight photowalk through downtown. We will finish our walk at Five Guys and can eat there. Come early and shoot in the park if you wish. We will gather up at 7:00 and leave the park by 7:15 at the latest. We will gather at the fountains on the northeast corner of the park near the Children’s Museum. Parking is available in the city garage next to the museum at the posted rates. Parking in metered spots on the surrounding streets is free after 6:00 pm. You may also park at the University of Tampa and walk over the bridge to the park. Pack lightly so that you can walk comfortably and shoot for about an hour and a half. As for gear recommendations it would probably be a good idea to have wide-angle to medium telephoto lenses and a tripod. Flash is optional but could be of use for some creative shots. Bottled water is always a good idea so that you can stay hydrated while walking and shooting. I’m looking forward to seeing everyone there on Friday night! There are a few updates on the Competition Rules page, most important is a clarification of the Modified Category for entries. We are also investigating the implementation of a few technical upgrades for the benefit of members such as adding the ability to pay dues on-line and live streaming of meetings on-line for the benefit of members who may be unable to attend in person on occasion. We will let you know as soon as they are implemented. Reminder: Competition has been moved to next week to accommodate our guest speaker, Andy from Unknown Photographer, this week. FYI, Robert and Jim are leading a night photography workshop this month as part of their regular SDL Photo Workshops series. Check out the SDL website for details and registration. Please join us on Saturday morning at 10:00 am for the next video presentation. This time the topic will be intimate landscape photography with photographer Bill Fortney. The assigned category for the January photo competition is Travel. Remember the cutoff time for entries on the meeting night is 6:45 pm and that you must have your dues paid to be eligible. If you wish to pay your dues at the meeting please fill out this form and bring it with you. Your current ranking, based on the final scores from 2011, can be viewed on the new score sheet. The next SDL workshop that Robert and Jim are doing will be at tRG studio on Saturday the 21st. The topic is food photography. If you are interested please go to the SDL website to find out more information and register. The votes have been tallied and the date has been set for Thursday night, December 15th, 7:00 pm at tRG Studio. Please bring a guest and a pot luck item for the party. We will also be having a photo print pinup as well so bring an unframed print to hang and you will have an opportunity during the evening to tell us the story behind the picture. We will also announce the annual competition winners in the A and AA categories and award prize money. We are looking forward to a fun evening for all! Enter your email address to subscribe to this web site and and be notified of new posts by email. We are pleased to invite you to join our organization! We are always actively looking to promote photography appreciation and photography education in a friendly social environment. You are invited to be our guest at the next monthly club meeting. Meetings are held on the 3rd and 4th Friday of the month. If you like what you see and hear, pay your dues and become an active member, it's that simple! Annual dues of $35 for the calendar year. Discounted available if you pay in advance by December 31st of the prior year. This is a password protected database of membership contact info. members may wish to use this info to contact each other privately for discussion, to set up shoots, etc.